Many anglers prefer to secure their fishing for the season, safe in the knowledge that they are guaranteed fishing on a beat of their choice. Traditionally, season rods have been for a named day per week and many Wye and Usk fisheries still operate on this basis. New, more flexible systems are becoming more common, however. For details of season rods on specific fisheries, please see the links below. Just under 1 mile of mostly left bank fishing on the upper Wye, a few miles downstream of Builth Wells. 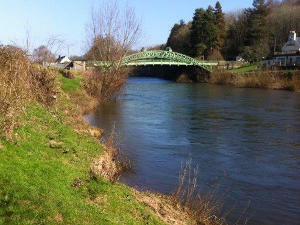 Abernant offers the salmon anglers two excellent high water salmon pools: Lady Alexander's Catch and Abernant Stream. The Edw Pool and Stone Catch are well worth a cast too. Abernant also holds good numbers of trout and grayling and for the coarse anglers some sizeable chub and dace. The riverbed is a mostly gravel so wading is relatively easy for an upper Wye beat. The Stone Catch and Edw Pool are more boulders and bedrock so wading is difficult in places there. Chest waders are required to get the best out of the fishing, with stud or stud/felt soles mandatory. There is a 200m (218 yard) walk from the parking spot to the mid section of the river. Season rods can fish every day of the week, subject to availability. Rods can book their day in advance or on the day using the online booking system. These three upper Wye beats are classic fly waters but, in common with all up river Wye beats, are dependent on favourable water flows. They are let in a novel way that overcomes the problem of "never being there on the right day". So, a pool of rods is able to access the beats on almost any day of their choice using the Fishing Passports self-booking system. The number of rods is fixed on each beat. Consecutive days can be fished under this system to accommodate those who can stay over but live a distance away. The three beats offer a good mix of high and low water pools. Gromain has a boat solely to fish the north (left) bank of the Ferry and the Middle beat has a boat alternating between the Home Catch and Llangoed and Orchard pools. Gromain has a number of platforms to enable fishing some of the tougher bits of wading (Gromain Top planks, Bachawy boards, Spout, Spring pool, Ferry (left bank) and Bridge pool). Elsewhere, most pools can be fished from the bank or wading, given normal care. Limited rod numbers ensure it is never overfished and in all, over 3.6 miles with 44 pools are available with some of the best fly fishing on the river. There is some excellent trout and grayling fishing for those interested. 1 ¼ of double bank fishing with 10 pools of very attractive fly-fishing. This is available on the same basis as GLLR above enabling a season rod to fish on any day of the week and book themselves in accordingly. 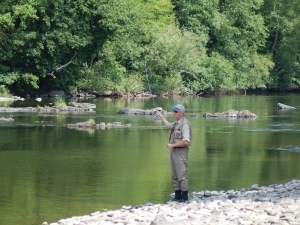 Ty Newydd also has top quality trout and grayling fishing. Spring salmon syndicate rods for unlimited access 3rd March to 15th June inclusive. Consisting of just under a mile of bank the fisheries are well placed towards the top end of the lower Wye and conditions permitting can hold a good head of springers. Wyebank offers wonderful fly fishing water, and although only 400 yards (including the bottom 175 yards of Courtfield), there is a chance of taking a fish throughout its length. Courtfield is the beat for large springers, with 20lb+ regularly showing in catch reports. To purchase, please contact us or for more information please click here. Wyesham and the Duke's water is the first beat downstream of Monmouth. 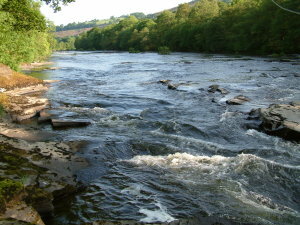 (The Monmouth to Estuary section is where the majority of Wye salmon are caught). It comprises 2½ miles of prime double bank salmon fishing, on the border between England and Wales and it has good fly fishing throughout. 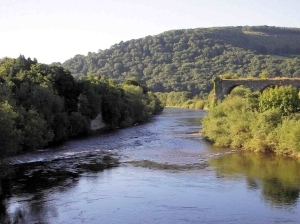 Set in the beautiful lower Wye Valley where the steep wooded banks begin to narrow forming the lower Wye gorge, this lower section of the river Wye below Monmouth benefits from being close to the tidal limit. Rotating beats with excellent fly fishing on all. 2019 : Fully Let. Please contact us to register your interest for 2020 rods. Occasionally, day tickets become available which are usually advertised on the Salmon Catches page. 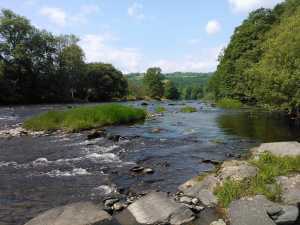 Approximately 2miles of double and 1 mile of single bank fishing on the River Irfon at Llanynis some 4 miles from the confluence with the Wye and 3 miles from Builth Wells. The beat averages 30 yards in width and has an excellent variety of water. The wading difficulty also varies - relatively easy in the gravel sections but more difficult over the bedrock. 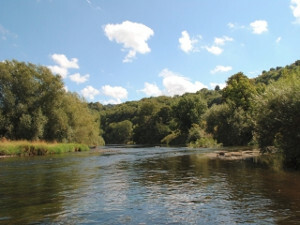 Cefnllysgwynne offers good trout and excellent grayling fishing, with the possibility of occasional salmon later in the season (The Salmon season ends on 25th October on this river). The Irfon rises and falls quickly after heavy rain, usually being fishable within 24 - 36 hours of a flood. Season rods are flexible and not tied to one day per week. Season rod holders must be aware that day ticket anglers may also be booked onto the water. Excellent self-catering accommodation in a 2 bedroom cottage or a 4 bedroom farm house (sleeping 4 or 8 respectively) is available close to the fishing. A 2km stretch of River Usk fishing downstream from Llanfaes Bridge in Brecon. The river here mostly flows over gravel meaning that wading is easier than other parts of the river. Along with some good trout fishing, this stretch also has some decent salmon pools. The wild trout population is also supplemented by occasional stocking. 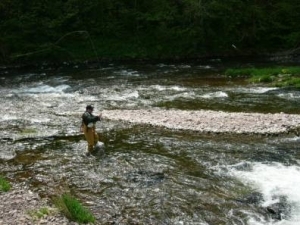 The Tyr Afon, Fro Isaf and Bryn beats in the middle reaches of the River Usk constitute some of the finest fishing on this famous Welsh river. In beautiful and varied scenery, the fishing extends to 2 miles and the rights to fish are mostly from both banks. The estate lets out three trout and salmon beats on a seasonal basis. The rights to fish are mostly from both banks. 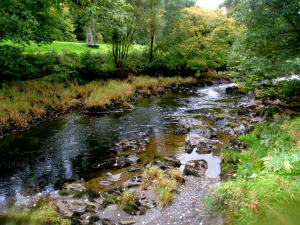 The beats provide interesting and varied salmon and trout water in delightful surroundings. 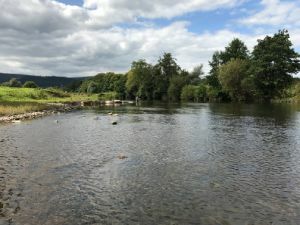 The Usk is noted as an early season river for wild brown trout with the occasional sea trout (although the latter are rarely targeted). In most years the occasional salmon will have taken up residence at Llanover in March although the best of the salmon fishing is from April onwards. The banks have easy access and as this part of the river flows mostly over gravel, the wading is relatively easy. Llanover also has a resident ghillie on hand to advise. The river is a notified Site of Special Scientific Interest (SSSI) and European Special Area of Conservation (SAC). Just over 1km of mostly right bank (0.5km of double bank) mid/lower river Usk salmon and trout fishing, a few miles upstream of Usk town. This is a rare chance to fish a very exclusive part of the river on a day ticket. The beat has 6 named pools with the Rock Pool probably being the best of the salmon lies. The Upper Rocks and Wood Stream are also productive pools with the Bridge Stream and the Cables being worth a cast with a fly in higher water. All the pools fish well with a spinner (please note that at the request of the owner, the beat is fly only until June 16th). The wild brown trout fishing in this part of the Usk is excellent with good numbers and average size. Chainbridge offers good opportunities for trout anglers throughout its length. Access to the fishery is excellent with a private car park next to the water, although some sections are a short walk (350m - 500m). The wading is of mixed difficulty - a large part of the fishery has a gravel river bed but there are sections of bedrock and stones that are a little more difficult underfoot. A pool of rods is able to access the beats on almost any day of their choice using the Fishing Passports self-booking system. Please call 01874 712074 to purchase.